CBS Pittsburgh featured Allegheny Cleantech University Prize fan favorite, Minimus, for their work building the Keystone Tiny House Community for Veterans. The project will give 17 homes to veterans in need. Minimus delivers hyper-efficient, DC powered homes that are highly customizable and socially beneficial. Cleantech University Prize (Cleantech UP) helps student entrepreneurs with promising clean energy solutions get their ideas out of the lab and into the market by providing the training, mentorship, and financial resources they need to become investor-ready businesses. We spoke with some of the 2017 regional winners about what they gained from the program. Swift Coat invented a nanoparticle coating to replace the expensive silver and indium tin oxide layers on solar panels. Swift Coat is currently focused on serving their first two paying customers, a billion-dollar glass manufacturer and a solar manufacturing equipment supplier. “As we ship those samples off for evaluation in the next few months, we’ll be using the funding we’ve received over the last year to scale up our technology and seek more customers,” says Firth. The Infinite Cooling team with VentureWell’s Brenna Breeding. Infinite Cooling’s technology reduces power plant water consumption by capturing steam escaping from cooling towers. After the Cleantech UP competition, the Infinite Cooling team will be participating in the summer accelerator at MIT delta v, while simultaneously running their first industrial pilot at the MIT Cogeneration Power Plant. “Networking with other entrepreneurs and industry leaders have generated many new ideas and potential partnerships,” said CEO Austin Webb. RoBotany is looking to close its Series A financing in the near future and begin building its full-scale farm located near downtown Pittsburgh. After the National Competition, the team will be participating in the Capital Factory Accelerator in Austin, Texas while launching their beta program in Lagos, Nigeria. Cleantech University Prize (Cleantech UP) business plan competitions provide aspiring student entrepreneurs with the mentorship, business development skills and training, and investor feedback to transform their clean energy ideas into impactful businesses. Launched in 2015, Cleantech UP builds upon its precursor, the DOE National Clean Energy Business Plan Competition. Since the competition started, participants have formed more than 200 ventures, created more than 115 jobs, and raised more than $120 million in follow-on funding. Winners of the eight regional competitions will compete in The Cleantech UP 2017 National Competition on June 26 and 27 in Austin, Texas. 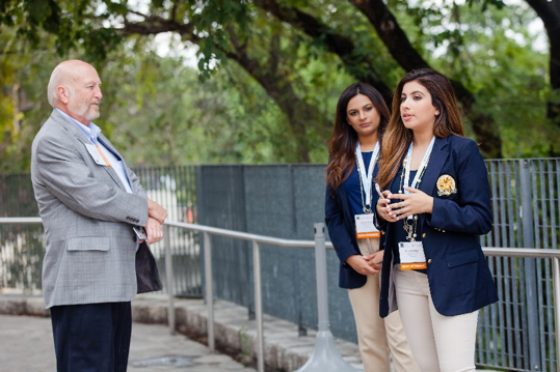 The National Competition is made possible through a collaboration between the U.S. Department of Energy, VentureWell, and the eight Universities and Organizations that host each regional competition. WEAV3D from Georgia Institute of Technology took first place at this year’s final Cleantech University Prize (Cleantech UP) regional competition, the University of Central Florida MegaWatt Ventures. The company is redefining the manufacturing technology for automotive body components by automating the composite forming process. WEAV3D is developing a composite forming technology that will reduce the manufacturing cost of carbon composites by 50% and increase production rate by 10 times. Following in second and third were Thor ORE (University of Central Florida) and SkyNano Technologies (Vanderbilt University). Thor ORE’s Nano-Filtration System is capable of extracting rare earth elements from the waste stream of active mines and plants located in the U.S. SkyNano has developed a scalable method that uses carbon dioxide, electricity, and inexpensive materials as direct inputs to produce high-value carbon nanotubes. The company believes this unique manufacturing process will make SkyNano the lowest cost provider of both commodity-type and specialty-grade carbon nanotubes. These clean energy teams will join others from across the country at the National Cleantech UP competition June 26-27 in Austin, Texas. To learn more about the others competing this summer, visit the Cleantech UP website. The U.S. Department of Energy’s Cleantech UP business plan competitions provide aspiring student entrepreneurs with the mentorship, business development skills and training, and investor feedback they need to turn their clean energy ideas into businesses offering real-world solutions. Cleantech UP is part of the Tech-to-Market Program within the Office of Efficiency and Renewable Energy. Vescence from the University of Houston took home the top Cleantech University Prize (Cleantech UP) award at this year’s California Institute of Technology (Caltech) First Look West (FLoW) business plan competition. The startup’s founders have developed a patented water repellant coating that minimizes contaminant buildup on the glass surface of solar panels. Vescence is field testing its innovative technology on 40 solar panels at the University of Houston this summer. Taking second and third place at the Caltech FLoW competition were South 8 Technologies, Interphase, and Membrion. South 8 Technologies has developed a novel chemistry for lithium batteries that could lead to the next generation of energy storage devices. The team from the University of California San Diego anticipates having a prototype line ready for testing with customers as early as 2019. Interphase Materials from the University of Southern California and Membrion from the University of Washington tied for third place. Interphase Materials has developed a surface treatment technology for water-based industrial cooling systems, which reduces utility spend by increasing heat transfer efficiency and protecting against bio-fouling and corrosion. The technology creates a nanolayer on cooling system hardware to improve interactions between cooling water and tubing. Membrion has developed high-performance, low-cost membranes that improve the performance of flow batteries. Flow batteries have been identified as the optimal choice for grid-scale energy storage but have never scaled rapidly due to the costly price of the membrane. These clean energy teams will join 21 others from across the country to compete in the National Cleantech UP competition June 26 – 27 in Austin, Texas. The U.S. Department of Energy’s Cleantech University Prize (Cleantech UP) business plan competitions provide aspiring student entrepreneurs with the mentorship, business development skills and training, and investor feedback they need to turn their clean energy ideas into businesses offering real-world solutions. Cleantech UP is part of the Tech-to-Market Program within the Office of Efficiency and Renewable Energy. Princeton University students developing an emission-free, electric outboard boat motor took home the top Cleantech University Prize at the 2017 Rutgers LaunchR Competition. The team, Revolution Outboards, believes their technology will bring a light, efficient, reliable, and safe outboard boat motor to the marine industry. The two runners-up from the LaunchR competition were Xtream Energy Technologies and ElectroMetro, both from Rutgers University. Xtream Energy Technologies has developed a Cyclic Pitch Turbine, a vertical axis fluid turbines which harnesses energy from tides, ocean currents, and rivers. The blade design increases efficiency and enables stacking, thereby reducing the levelized cost of electricity compared to conventional designs. ElectroMetro is building a low-emission, self-refueling hydrogen hybrid vehicle. The vehicle uses a solar panel to drive a hydrogen fuel cell that is optimized for separated containment of hydrogen and oxygen gases to increase fuel efficiency. Revolution Outboards, Xtream Energy Technologies, and ElectroMetro will join the top three teams from Cleantech UP’s seven other regional competitions in Austin, Texas June 26 – 27 to compete for the National Cleantech UP prize. When it comes to cleantech startups, it is regrettable that women remain a minority. Slowly, but surely, we are changing that. In order to meet the energy challenges of the future, ideas and talent must come from all members of society. So when it comes to cleantech startups, it is regrettable that women remain a minority. The gender gap is particularly amplified for two reasons: 1) Women are less likely to go into STEM fields, and 2) overall, women are less represented among entrepreneurs. The good news is that awareness of the issue led to an increase in programs and funding to support efforts to close the gap. One prominent example is C3E, an initiative launched by the 25-government Clean Energy Ministerial in 2010 to provide support and recognition to young women leaders in the field. 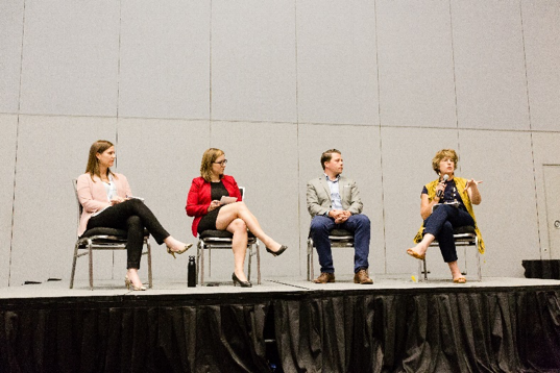 C3E joins a myriad of organizations working in tandem to support women in STEM, energy, and startups including Women’s Energy Network, Women of Wind Energy, Science with Sophie, Ms.Tech, and the Society of Women Engineers. Since 2012, Clean Energy Trust has been proud to partner with ComEd, in offering a $25,000 Female Founder investment award. That award is part of what makes up our total $1M annual investment fund and is an important commitment to including and supporting women-led cleantech companies. Now part of our portfolio, recipients Vicki Gonzalez (CEO, Nexmatix, St.Louis, MO) and Lisa Laughner (CEO, GoElectric, Anderson, IN) continue to drive their companies’ success. This year, we have two forward-looking, cutting-edge women who are leading their cleantech startups into the future. Susan Sprentall and Samantha Lindgren are on the front lines in the efforts to close the gender gap in the cleantech entrepreneur community. Support them in-person at the final Clean Energy Trust Challenge event on May 9th! Purchase tickets here. Surclean uses patented laser technology to maintain and clean large surfaces with no chemicals or hazardous waste. Naval destroyers, 747s, and bridges all have one thing in common – these surfaces must be cleaned and maintained. Surclean’s unique combination of laser and sensor technology enables this process to be completed faster, cheaper, and with no environmental impact. Recently, Susan has been competing in Department of Defense innovation programs and won Michigan’s Automation Alley award. Sun Buckets is a unique solution to the issue of global energy access. It uses parabolic solar technology to create a novel cookstove that can store solar energy for up to 6 hours. The cookstove can be used easily inside or outside and affords the ability for people to cook in their traditional styles. More than 3 billion people around the world use solid fuels to cook their food – not only does this practice create hazardous smoke, but people can often spend valuable time collecting and buying fuel. Samantha is passionate about the mission of energy access and providing a personal fuel solution for people who really need it. She cooks for her own family using a Sun Bucket, and blogs about the recipes and experiences. This article was first published on Clean Energy Trust's blog. Will Allen is a former NFL safety, whose 12-year career includes playing for the Pittsburgh Steelers, Dallas Cowboys, and Tampa Bay Buccaneers. Now, he’s a player in the energy arena. His new company, NGH Energy a Nascent Group Holdings Company, is focused on business ventures related to energy services, energy technology and engineering consulting. Recently, Allen served as a judge at the Energy Department’s Cleantech University Prize Competition in Pittsburgh. After the competition, we asked the question everybody wants the answer to. Why energy after professional football? My interest in energy started back in 2008 when I was looking at buying an electric car. The car I was looking at was really ahead of the curve, but people around me advised not to buy one because the technology wasn’t quite there. While they ended up being right about electric cars then, my interest in new energy technologies continued. I started looking at other renewable and alternative energy technologies out there, and was surprised that so much of this information was new to me. In school, I had chemistry and physics, but didn’t understand power generation or how energy alternatives like solar, wind, and hydropower fit in. This got me thinking, how many more people don’t know this or just don’t care? As I learned more about energy policy, the grid, and business through my own research and then through continuing education classes supported by the NFL, I realized that I could help those who don’t know or understand this very complicated sector become more knowledgeable. Ultimately, I can utilize my network, reach out to people within my own ecosystem and community, and bring some energy awareness to new audiences. A couple years after my continuing education classes in entrepreneurship at Harvard and Kellogg, I learned about the NFL Players Association internship program. This program helps players explore possible careers after football. A lot of guys want to work in hospitality management or sports marketing, but I wanted to be a part of something that the whole world needs. And the world needs energy. So, the NFL Players Association helped me get an internship with National Grid in Boston. While there, I learned about the company’s internal workings, business development, and strategy. Later, I spent time with a few technology companies in the energy space and data analytics, and loved it. I also worked for Congressman Bobby Rush, the ranking Democratic member on the House Energy Subcommittee. Ultimately, I just dove right in and absorbed it all. I learned a lot and keep learning a lot, which is helping me do business in the energy space. Any skills from your football career that are relevant now? Yes. In football I had a process that worked. I learned it and refined it, but was also always learning. Now I’ve transferred that focus on research and prioritizing over to business. I’m also surrounding myself with mentors, much like I did as a young NFL player. I played with Hall of Famers, the best of the best. I wasn’t a Hall of Famer, but I had a long career because I was able to pick up pieces from people I played with and apply it to my own game. That’s exactly what I am doing in business and the energy sector. I’m learning from people with great reputations, who are credible, and who have worked in different parts of both energy and business. They’re giving me something to aspire to as well. You do a lot of clean energy-related speaking engagements. What’s your biggest message? I challenge everybody in the room to not work in silos, but work with each other and understand what people in other parts of the business are doing. If you are just doing what you are told, you miss a lot of opportunities for collaboration and chances to pass on your expertise to other communities. There are so many ways to reach out and really spread knowledge about energy efficiency, clean energy, and the energy workforce. You’ve got to be active. 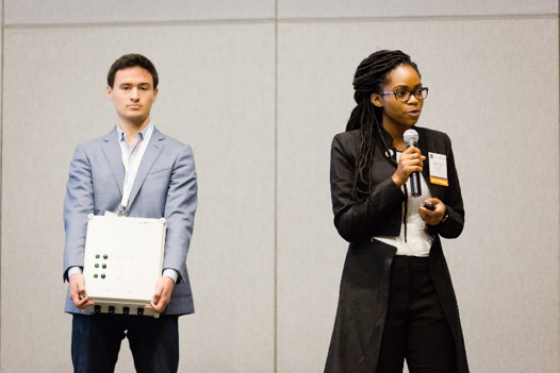 MIT’s Infinite Cooling won the top Cleantech University Prize at the 10th annual Massachusetts Institute of Technology Clean Energy Prize (MIT CEP), the nation’s largest student-run, clean energy-focused business plan competition. Infinite Cooling’s innovative, patent-pending technology can reduce power plant water consumption by capturing steam escaping from cooling towers and reintroducing the resulting water into to the cooling system. This novel technology can also save power companies potentially millions per year in water costs. Stanford University’s Solstice Energy Solutions, UC Berkeley’s Flux Technologies, and MIT’s Joro also took home awards at the MIT Clean Energy Prize event. To learn more about the MIT CEP and this year’s competitors, please visit the program website. Swift Coat from Arizona State University won the top Cleantech University Prize award at the 2017 Rice Business Plan Competition. The company's novel technology includes an aerosol can-inspired tool to deliver highly customizable nanoparticle coatings. The nanoparticles can be applied to a variety of surfaces--hard or soft, smooth or rough, flat or curved. Swift Coat is currently developing solutions to help lower the cost of solar photovoltaic panels. The team estimates their technology can decrease solar cell producers' capital expenses by 16% and lower manufacturing costs by 10%. The two runner-up teams also invited to compete for $100,000 in prizes at the Energy Department's National Cleantech UP Competition in June are MITO Material Solutions from Oklahoma State University and Lilac Solutions from Northwestern University. MITO Material Solutions’ innovative nano-additive infused with epoxy or resin used in fiber reinforced composites enables lighter and tougher composite materials that can increase transportation sector fuel efficiency. Lilac Solutions’ lithium extraction process uses unique ion exchange materials to boost lithium production and bypass traditional evaporation pond methods, thereby reducing costs, decreasing environmental impacts, and increasing output of this critical resource for electric batteries. Swift Coat, MITO Material Solutions, and Lilac Solutions were just three of 42 teams competing at the 2017 Rice Business Plan Competition. visit the competition's websiteTo see their quick pitches and learn about the other competitors, visit the competition's website. Forbes recently rolled out its 30 under 30 in Energy list in January. This annual round up, conducted by Forbes and evaluated by three energy industry judges, highlights the country’s top young talent focused on solving our energy challenges. Included in the 2017 class are six innovators who have participated in or worked with a number of the Energy Department’s Office of Energy Efficiency and Renewable Energy (EERE) programs. EERE programs support clean energy entrepreneurs and innovators at many different stages of their technologies' development. However, these opportunities are also important to giving younger energy innovators a seat at the table. When asked what advice those named to this year’s Forbes 30 Under 30 list have for other young innovators, here’s what they had to say. "Working in clean energy is not always easy, and every one of us in this space has and will encounter headwinds—economically, structurally, and politically. Don't let yourself be swayed. The only sustainable future is one powered by clean energy, and initiative, hard work, and dedication will get us there." Sustaining American competitiveness in a global energy economy means creating the space for the best and brightest, no matter their age, to test and validate their new solutions. EERE applauds these six young innovators for leading the way and inspiring others in their generation to take on America’s current and future energy challenges. As a Cleantech University Prize (Cleantech UP) competition judge, I’ve seen some amazing business plans and given lots of feedback. 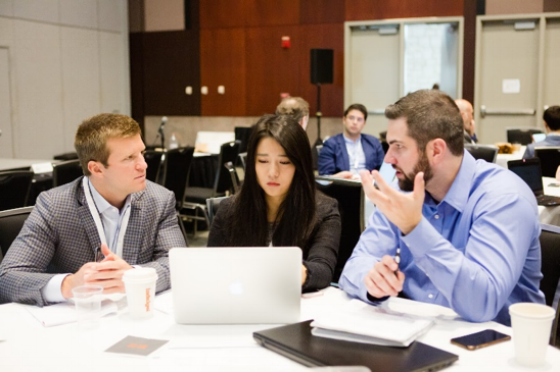 These collegiate business plan competitions give aspiring university student entrepreneurs a real-world opportunity to test their business plans and elevator pitches in front of investors and industry leaders. In return, these young innovators receive industry mentoring and pitch feedback from high caliber judges. Ultimately, these resources can help university student entrepreneurs take their clean energy startup to the next level. In 2016, 255 entrepreneurial university student teams applied for eight regional Cleantech UP competitions. Half of them were selected to compete, and only eight took home a first place prize. What helped these winners stand out in a crowded field, and how can other university student entrepreneur teams succeed next time? Here are the five tips I give most often. One of the biggest mistakes teams make when pitching their clean energy idea is not clearly stating who would potentially buy their product and why. Having a great technology and knowing who your key partners are is important. But ultimately, your pitch should clearly identify your potential customers and why your product is a good fit for them. Understanding your product’s market landscape is crucial to making your technology stand out. Remember, these competition judges have heard hundreds of pitches—and not just from student entrepreneurs. Demonstrate that you’ve researched other companies in the clean energy space you’re trying to enter and articulate your differentiation and competitive advantage. Not only will this strengthen your business plan, it will also help prove to the judges that you know your invention’s unique value and market opportunity. Just do it, early and often. You’ll be more comfortable with your pitch and more confident in front of the judges. If you can, try to practice either on location or in similar settings. Presenting as a group? Make sure to clearly define each team member’s role in the pitch early on, and practice smooth transitions between team members. We’ve all seen PowerPoint presentations filled with tiny text or overly technical diagrams or abstract images. When putting together your pitch slide deck, think through what information is most important to the judges. Hitting the high points in your speech is vital, but having these stand out in your visuals is important too. Make sure the problem you’re solving, your unique value proposition, your financial projections, and your strategy for scaling and getting to market are clear, concise, and relevant to the story you’re telling the judges. Ultimately, this is the information your audience won’t forget. While not all business plan competitions focus solely on clean energy technologies, the collegiate Cleantech UP prizes do. This is important to remember as you’re applying to the program and preparing to pitch your innovation. Strongly answering how your product fits within the Energy Department’s Energy Efficiency and Renewable Energy portfolio and how it could impact the clean energy space will help you succeed in these cleantech competitions. 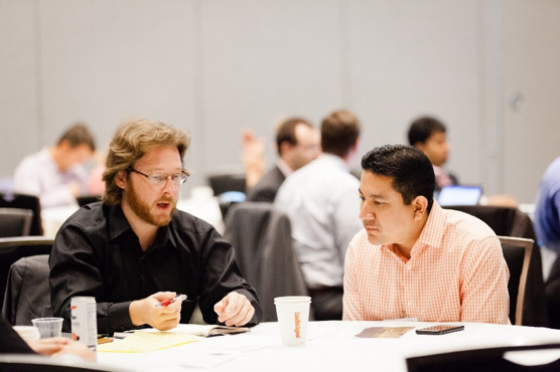 Cleantech UP competitions give participants so much more than a cash prize. These opportunities connect you to mentors and physical resources that can improve your business model and help you execute your business plan. Whether you’re competing this year or in the future, you can take these simple tips and start improving your business pitch now. Case Western Reserve University’s RVS Rubber Solutions took home the top $50,000 prize at Clean Energy Trust’s 2017 Cleantech University Prize (Cleantech UP) Midwest Showcase. The company, based in Cleveland, Ohio, has created a solution to recycle rejected tire components and turn them into a high-quality, low-cost, and environmentally-friendly rubber source ready for new applications. In addition to RVS Rubber Solutions, runners up BluSolar (Millikin University in Decatur, Illinois) and Purpled (Northwestern University in Evanston, Illinois) will compete in the Energy Department’s National Cleantech UP competition in June 2017. Visit www.cleanenergytrust.org to learn more about the Clean Energy Trust 2017 Midwest Showcase and this year’s winners. Stanford University’s Solstice Energy Solutions won the top $50,000 prize at the University of Berkeley’s Cleantech University Prize (Berkeley CUP) collegiate competition. The company uses data-driven approaches and integrated technology to solve energy challenges for millions of homeowners and small businesses around the world who rely on both grid and distributed energy sources. Solstice’s first product allows seamless shifting between energy sources, enabling better efficiency and simple energy management. UC Berkeley-based Noble Thermodynamics and Flux Technologies will join Solstice at the U.S. Department of Energy’s National Cleantech UP competition in June 2017. Visit www.beci.berkeley.edu/cup to learn more about the Berkeley CUP and this year’s competitors. We [in New York] are joining together and committing ourselves to tackling climate change and showing the nation what is possible. Now it is up to world leaders to follow suit,” NY Governor Andrew Cuomo proclaimed on a chilly October morning at Columbia University last year, with former-Vice President Al Gore standing beside him. Governor Cuomo, for years, has built a steady suite of statements, policy actions, and state initiatives to make New York a model of clean energy investment and implementation. Last year, he signed the “Under-2-MOU” commitment to keep global temperatures below 2º C, along with Vice President Gore, preceding the global climate talks set to occur in Paris within a few months. Meanwhile, down in lower-Manhattan and Brooklyn, clean technology companies and research organizations have been gloriously flourishing, with no sign of any market factors breaking them down. New York City is the cleantech epicenter of the East Coast- you don’t need to be a well-networked professional to see it. City and state financial initiatives are fueling waves of new companies that are finding nesting grounds at incubators like NYC ACRE, a growing cleantech hub operated by the NYU Tandon School of Engineering, NYSERDA (New York State Energy Research & Development Authority), and NYC EDC (New York City Economic Development Corporation). These companies are challenging the status quo by providing new products, resources, and research in their respective industries: take EnerKnol, an energy policy data company that aggregates real time governmental action and data regarding renewables for the companies and institutions that need it, and that is also building a huge community in the NYC finance world around cleantech investment at the same time. There’s also BlocPower, an emerging startup led by a former Obama For America staffer that bridges the finance and engineering gaps between impact investors seeking financial returns and developing communities in inner cities that need clean energy retrofits, but lack the necessary resources to do so. These are just two disruptors on a long list of organizations and companies that are building a sustainable future for New York--and the world for that matter. As an NYU student, and now as a 2015-16 Spark Clean Energy Fellow, I’ve gotten a chance to see all of this firsthand. The cleantech world in New York is an endearing one in that if you simply put in the effort and walk up to the doors of an incubator or public cleantech event, you’re immediately introduced to an interconnected world where job opportunities and community roles are aplenty. I was able to connect with students in the NYU sustainability community who provided connections to NYC ACRE, which then allowed me to meet a wealth of cleantech company founders, academic finance and engineering experts, fellow students, and it also gave me a chance to attend impactful and exciting events that brought in people from all aspects of this community. Leveraging these community connections helped me provide networking opportunities as a Spark Fellow, spreading our message to more students, which has had a profound impact on my goals and where I plan on trying to get a job after I graduate. I’ve only been a student within this community for a few years, but I’ve learned a great deal. And the most important thing that any student seeking to make a difference in the fight against climate change should know, is that the first step is to show up, start talking, and start making connections. The rest will come into place as you begin your journey.